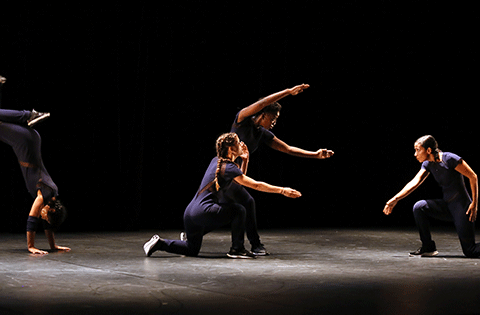 A powerful dance performance by one of the reinventors of breakdance. Autarcie (….) is a game of strategy where four dancers engage in a frantic ritual, alternating between forward-facing dance moves and free digression. They transform their respective dance specialities of breakdance, popping and waacking into an abstract vocabulary, establishing their powerful individualities on stage and thrusting themselves into the space in pursuit of territory, alliances and hierarchy. The front of the stage is the rallying point where the dancers come together and devise a warrior dance directed at the audience. The inner workings of this restless “tribe” with all the power struggles that ensue and the search for possible points of harmony, thus unfold on stage, to the pulsating, unbridled rhythms of the percussive organic beat. Anne Nguyen founded the par Terre Dance Company in 2005. A specialist of breakdance, she is influenced by a scientific background and a practice of martial arts. She creates choreographies that highlight the principles and energies of hip-hop dance in shows with universal symbolics. Based on the combination of a technical, high-performance dance form with highly graphic, pure, destructured choreographic compositions, Anne’s productions convey a feeling of abstraction and challenge the place of the human being in the contemporary world. Anne Nguyen was awarded the 2013 SACD Nouveau Talent Choréographie prize and appointed Chevalier de l’Ordre des Arts et des Lettres in 2015. She is an associated artist to Théâtre National de la Danse de Chaillot until 2018. With the support of: l’ADAMI. Coproduction: Théâtre Paul Eluard de Bezons, Scène conventionnée; Théâtre Paul Eluard de Choisy-le-Roi; tanzhaus nrw, supported by Take-off: Junger Tanz Düsseldorf; Centre chorégraphique national de Grenoble – dans le cadre de l’accueil studio 2013; Centre chorégraphique national de Rillieux-la-Pape – Direction Yuval Pick; Parc de la Villette (WIP Villette); Centre de Danse du Galion d’Aulnay-sous-Bois; L’Avant-Scène Cognac – Scène conventionnée “inclinée danse”. Autarcie (….) is funded by Aide à l’écriture granted by the Beaumarchais-SACD association. The guest-performance is supported by Teatroskop in the frame of FranceDanse Orient-Express. Teatroskop is a project initiated in 2011 by the Institut français, the French Ministries of Culture and Communication and of Foreign Affairs and International Development. Tickets Price: 15, 12 BGN Duration: 50 min.